John Wilker-Blakley was born in Winnipeg, Manitoba to an Airforce family. At age three his family moved to Ottawa where they still live. John was educated in Ottawa, attending public, intermediate, High School, and Carleton University, and attaining a B.A. in Religious Studies, before going to Huron University College in London, Ontario. At Huron, John received a Master of Divinity Degree. John was ordained Deacon and Priest in the Diocese of Ottawa in 1983 and since then has served eight parishes in the Ottawa Area. John was made a Canon of the Diocese in 2010. He arrived in the Parish of March in October of 2017. John serves on the Board of the Ottawa Pastoral Centre (one of the Diocesan community ministries), as the Diocese of Ottawa Interfaith and Ecumenical Officer, and as an On-call Chaplain with the Anglican ministry at the Civic campus of the Ottawa Hospital. John believes that our theology and liturgy must speak credibly to our time and is committed to the Anglican Tradition as one which continues, in the spirit of the reformers, to bring ancient Catholic practice and contemporary theology together. He believes that the calling of the Gospel is to joyfully live the Gospel call to love, compassion, and peace, in a credible and modern way. John believes that the scriptures are living metaphors of God’s infinite love for creation and that we are called to be partakers in the blessings that this sheds in our lives. John is married to Wendy and between them they have three children, Bronwyn, Jenna and Alexander. His hobbies include regular gym attendance, wilderness camping, bush craft techniques, music and reading. A native of Belfast, Northern Ireland, the Reverend George Mervyn Dunn is interim associate priest in the Parish of March. A one time accountant, church organist and choir director in his native Ireland, Reverend Mervyn was ordained to the Irish priesthood in 1973 and promptly served as both curate and rector in several parishes in his homeland. Then he and his wife Jennifer and their three children – Paul, Claire and Timothy decided to emigrate to Canada in 1982, where they first served the Anglican Church of Canada in Iroquois Falls in the northern Diocese of Moosonee. Following this initial posting in the Ontario Northland, Reverend Dunn served churches in the Dioceses of both Niagara and Ottawa, before leaving for the United States in 1998 to minister in the Episcopal Church there -- in the Dioceses of South Carolina, Tennessee and Georgia. Retiring from full-time ministry in 2010, he and Jennifer – for over 30 years a licensed lay reader and long-time partner in ministry, returned to Canada. The Dunns assisted for a short while at the Parish of St Thomas, Alta Vista, before being asked to help out in the Parish of March. They say they particularly enjoy visiting parishioners and making new friends. In his spare time, Reverend Mervyn enjoys gardening, painting and decorating and indulges his fondness for model railroading. The Ven. Sally Gadd is honorary assistant priest for the three local church congregations of the Parish of March. She is a retired, full-time parish priest of the Diocese of Ottawa. Reverend Sally, who in the fall of 2013 celebrated the 25th anniversary of her mid-life ordination to the priesthood, is a native Vancouverite who grew up mostly in Vernon, B.C. She met her husband Ed while both were attending the University of British Columbia (UBC). In her youth, Sally Gadd was an accomplished track and field star; in fact at one point a record-holder – good enough at the hurdles and relay races to have been named, at the age of just 20, a member of the Canadian team at the Rome Olympics of 1960. She once thought she would like to become a veterinarian but in her younger life has actually held jobs as diverse as in the retail industry (briefly), and a much longer career as an invertebrate identifier and then biological illustrator with the Canadian Oceanographic Identification Centre. Dr. Ed Gadd is also retired. His work, for many years as a senior Health Canada scientist running Canada’s screening and approval processes for new anti-biotic drugs, had brought he and Sally to Ottawa and in the early 80s she decided to pursue and obtain her bachelor’s degree in religious studies at Carleton University. It was after this -- and after experiencing what she says was a powerful, very personal experience of the felt presence of God, that she decided to explore becoming a priest and entered St Paul University’s Anglican Studies Program. During these, her student and deacon days, she served at parishes including Almonte, Blackburn Hamlet, and St Mark’s, and St Matthias, Ottawa. 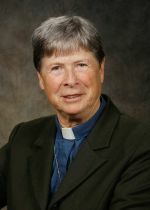 Ordained to the priesthood in the autumn of 1988, she was posted to Campbell’s Bay, Que., in the Pontiac; and then to nearby Shawville where she spent three more years before being named Rector of St Thomas Church, Stittsville from 1998 until her retirement in 2005. In addition to her ministry filling in for and assisting our regular and full-time priests, Sally has found great pleasure in regularly leading well-attended Christian Education courses in the parish. She has also taken on a multi-year role as the interim Archdeacon of the Deanery of Western Quebec – overseeing the small, mostly rural parish territory west and north of the City of Gatineau that she knows well as a former full-time priest in the Pontiac. She also serves on the diocesan parish growth and renewal committee – which provides consulting and practical advice to parishes on how they might restructure or reorganize to most effectively and efficiently deliver ministry within available resources that may be experiencing either growth or decline. An avid golfer, the energetic Rev. Sally also keeps fit year-round by walking. She and Ed have two children - daughter Jennifer, and a son, James.